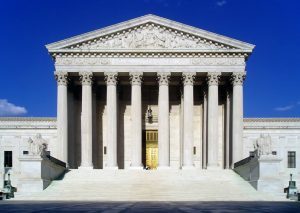 The U.S. Supreme Court heard arguments on Wednesday on whether federal law requires public schools to provide more than the bare minimum in special services for children with disabilities. The lower courts have disagreed about what kind of programs public schools must provide. Advocates describe the dispute as the most important case involving special education in public school in three decades. In 1975, Congress passed a federal law requiring school districts to provide an individually designed public education for each child with a disability. Those Individual Education Plans (IEPs) were intended to allow those students to learn with peers and achieve his or her individual potential. Under the Individuals With Disabilities Education Act, children with disabilities are entitled to a free public education that addresses their needs. The Supreme Court must now decide what level of services the schools must provide. Stanford Law professor Jeffrey Fisher argued that the most recent amendments by Congress specified a standard that requires sufficient services for children with disabilities to keep up with their peers. About 6.7 million children across the country qualify for these services. Fisher is representing an autistic boy from Colorado and his parents in the case. The boy’s public school refused to provide more specialized services for him, so his parents moved him to a private school for children with autism. At the private school, the boy made a marked improvement. The parents then made the decision to return to the school district, asking the district to provide some of the same expertise. The district refused, prompting the parents to sue the school district for the annual $70,000 private school tuition. A federal appeals court ruled that no tuition reimbursement was warranted. Some concerned about the case say that if the Supreme Court tightens the standard, it could cost some school districts lots of money. Justice Anthony Kennedy also appeared to be concerned about what would be reasonable for a school district to pay. Fisher said most services do not cost much at all, but regardless costs cannot be considered over what the law requires. Toyota Announces Big Investment In U.S.